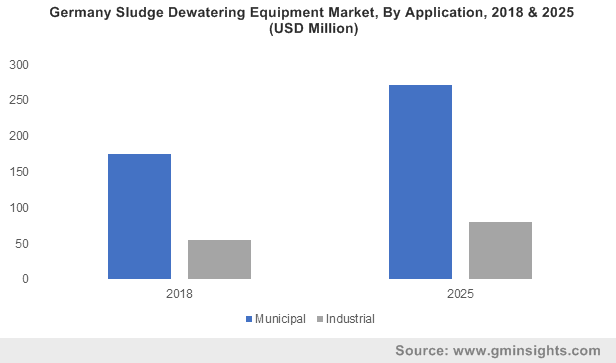 Sludge Dewatering Equipment Market size in 2018, was over USD 3 billion and is set to witness growth over 9% by 2025. Rising focus toward protection of surface waters from the adverse effects of wastewater discharges along with rapid technological advancements as a part of circular economy will drive the market size. Growing measures to minimize the hazardous impacts arising from wastewater streams will strengthen the deployment of wastewater & sludge treatment systems. Shifting trend toward green economy, including eco-efficiency, pollution control and closed-loop production focused on an enhanced resource efficiency will further stimulate the business growth. Stringent effluent and waste management standards & water discharge criteria across the globe coupled with shifting trends toward water reuse and resource recovery will drive the market. For instance, the Clean Water Act (CWA) sets out an elementary regulatory structure for the discharge of pollutants into the U.S. waterbodies and quality standards for surface water. Rapidly expanding industrial footprint and urbanization across key economies will further stimulate the product demand. 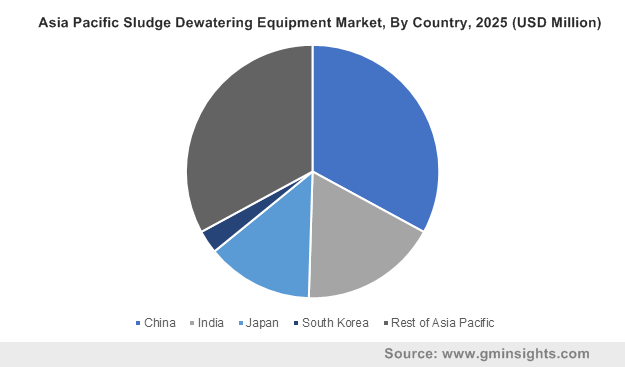 Shifting trends toward the sustainable growth and development will play a pivotal role in the expansion of sludge dewatering equipment market size. Increasing public awareness along with stringent legislative standards for the improved health & environmental protection will significantly stimulate the industry growth. Furthermore, strengthening global agendas on water resource management will positively impact the business landscape. 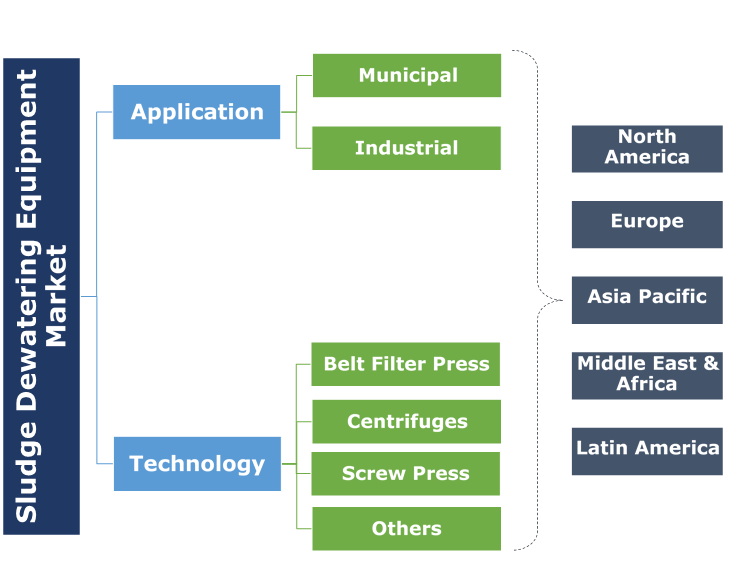 Sludge dewatering equipment market from belt filter press is predicted to grow over 10% by 2025. Regulatory measure to mitigate the impact of untreated municipal and industrial waste along with limited availability of land for landfills will augment the business growth. Introduction of stringent wastewater generation and discharge standards coupled with rising focus toward minimizing the ecological impact of industrial and municipal waste will further stimulate the product demand. 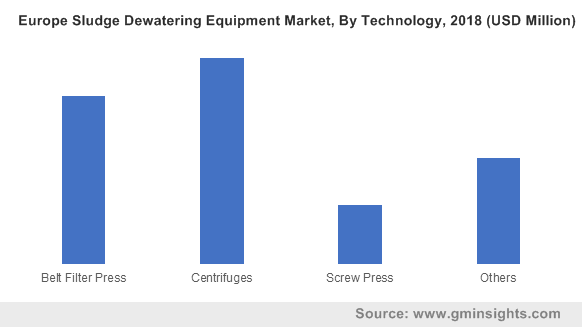 Screw press in 2018, accounted for over 10% of sludge dewatering equipment market share. Features including low operating costs, simple design and fully automated operation have significantly contributed toward increased product adoption. In addition, robust industrial sector growth along with comprehensive legislative efforts to mitigate the adverse impacts of wastewater from the industrial sector will accelerate the product deployment. These equipment have found significant penetration across municipal wastewater treatment plants and pulp & paper industries. Municipal application is predicted to witness growth over 9% by 2025. Limited availability of land for waste disposal across metropolitan centers has necessitated the establishment of wastewater treatment facilities which in turn will stimulate the demand for these systems. Rising focus toward minimizing the adverse environmental impact of undisposed waste will further boost the product penetration. The industry will further gain momentum on account of shifting trends toward recycling with regard to municipal waste. Increased discharges of inadequately treated wastewater coupled with investments toward development of new manufacturing facilities will boost the product deployment across industrial applications. Innovative sludge management approaches along with stringent government regulations to prevent disposal of untreated sludge will positively impact the business growth. Europe, in 2018, accounted for over 40% of the sludge dewatering equipment market. Stringent wastewater discharge standards along with resurgent economic growth will drive the demand for these products across the region. Increasing pressure on industries to achieve operational efficiencies, by simultaneously reducing the effluents concentration will encourage the product adoption across the region. The U.S. sludge dewatering equipment market size is anticipated to expand over 9% by 2025. Declining available water resources along with ageing wastewater treatment infrastructure will stimulate the product demand in coming years. Stringent regulatory norms coupled with efforts toward minimizing the disposal costs of sludge generated from wastewater treatment will further escalate the industry growth in coming years. Asia Pacific market is set to witness gains over 10% by 2025. Rising industrial production and growing urbanization is one of the key underlying factors which will stimulate the product demand. As per the United Nations, urban population across Asia Pacific is set to exceed 55% by 2030. Stringent wastewater discharge and sludge disposal standards along with limited availability of landfills will further enhance the business growth. Key industry players operating across sludge dewatering equipment comprises Suez Environnement, Keppel Seghers, Evoqua Water Technologies, ENCON Evaporators, Kontek Process Water Management, Veolia, Hitachi Zosen Corporation, Alfa Laval, Huber SE, Andritz, Flo Trend Systems, Inc. Phoenix Process Equipment, Aqseptence, Hiller Separation & Process, Flottweg, Sebright Products and Komline-Sanderson. Eminent players across the industry are focusing on various strategic assets comprising innovative product range, merger & acquisition, robust research & development activities as a part of their strategic initiatives. Moreover, companies are also focused toward providing extended service portfolio to have competitive edge over other participants. Sludge dewatering equipment are primarily used in wastewater treatment plant to segregate sludge into liquid and solid part. These are primarily used to minimize waste content that can save money by reducing disposal and handling expenses.